The Beaphar Activity ball has a treat dispensing feature and is made from colourful, durable plastic and is designed to suit the size of your dog. This item is perfect for a playful, lively dog that needs a lot of mental and physical stimulation and can be used both indoors and outdoors. 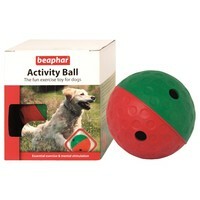 You simply insert the treats into the Beaphar activity ball and your dog will be rewarded when the treats fall out. This provides mental stimulation and helps develop paw to eye co-ordination while encouraging your dog to exercise. This was our dogs' best Christmas present. So much so, I'm ordering a second so that they don't bicker over it. The ball is a generous size and only has two holes for the treats to fall out, which means that it takes our dogs about 15 minutes to empty it as they use their noses and paws to push it around, which is great for making the treats last more than the usual split second and teaching the dogs to persistence. As the treats reduce in number, the longer it takes for the rest to fall out, without it becoming frustrating for the dog. The ball has a hard surface, so may not be a good choice if you're bothered about the paintwork on skirting boards!